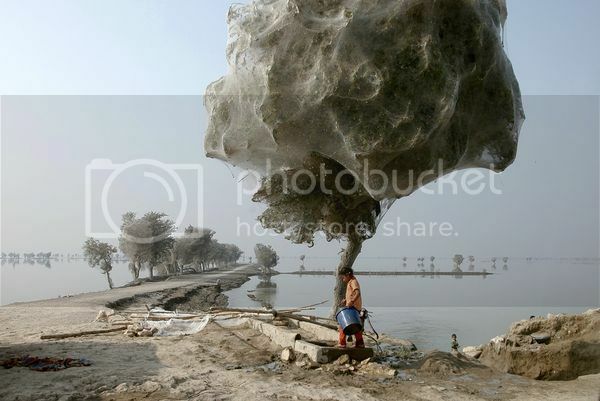 Seen in December 2010, a young girl stands next to a tree covered in webs in Sindh, Pakistan, near the intersection of two roads that had only recently reemerged from floodwaters. At the height of the crisis, the flooded region covered an area the size of England. Nearly 2,000 people died during the disaster and 20 million people were affected, according to the Pakistani government. “More people were affected by the flooding than the combined total of the Boxing Day Indian Ocean tsunami, 2005 Pakistan earthquake,  Haiti earthquake, and Hurricane Katrina,” John Barrett, head of DFID’s Flood Response Team, said in a statement. As part of the international response, DFID mounted the U.K.’s largest humanitarian operation yet. what Technology to use—Or nothing will Change. This is Primary First—-Not Science !